Medicom Toy continues to expand its officially licensed WWE Sofubi Fighting Series, and The Blot is so happy about it! I freaking love these retro stylized figures of WWE and WCW Superstars from the ‘80s and ‘90s. 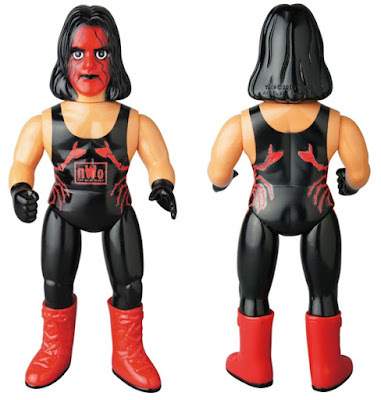 The newest figure in the series is NWO Wolfpac Sting sporting his Crow inspired red face paint and red and black tights. Finally, fans can pit The Franchise vs Hollywood Hogan in an epic sofubi battle! Now if only we could get fellow NWO Wolfpac members Kevin Nash and Scott Hall added to this toy line! The NWO Wolfpac Sting vinyl figure stands approximately 10”, and is cast in soft Japanese vinyl with 3 points of articulation. 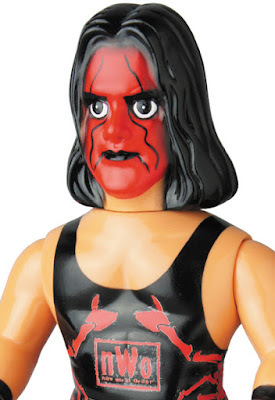 This is the fourth version of Sting to be released as part of Medicom's Sofubi Fighting Series, and it is expected to start shipping internationally from Japan in late August 2017.